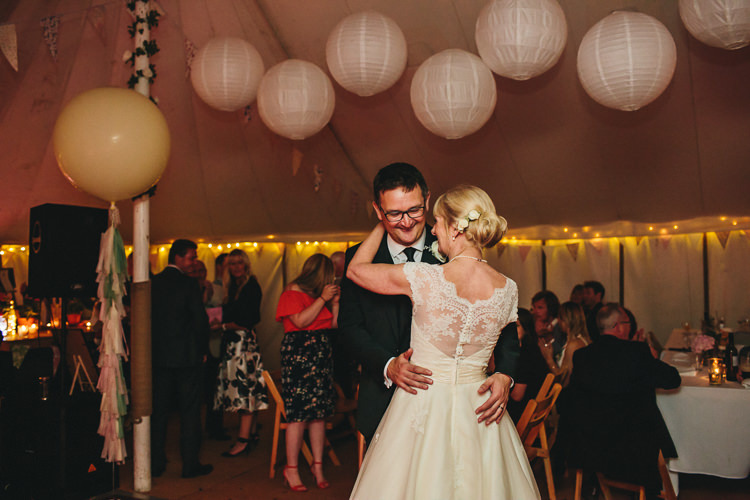 WWW readers Gill and Steven planned a beautiful marquee wedding with a vintage garden party theme. 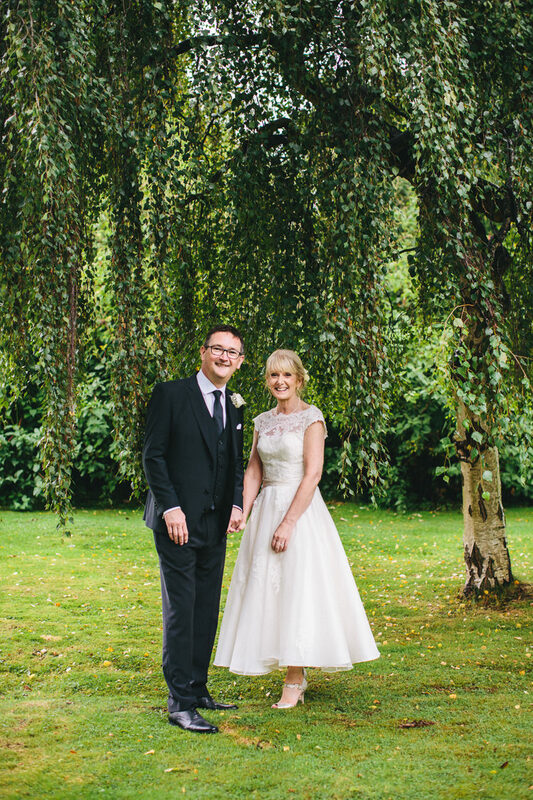 They were married at Chester Registry office followed by a reception at their favourite country pub, The Cholmondeley Arms on the 3rd September 2016. They didn’t want anything showy, rather a relaxed day with friends and family and I think you’ll agree, it was all simply glorious. 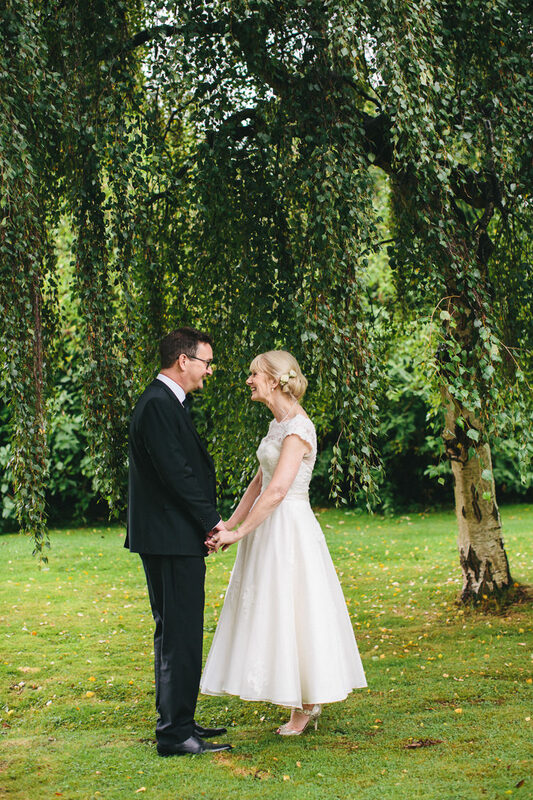 Gill wanted a ballerina-length dress like her Mum and found the one in Frederica from Louise Bentley. 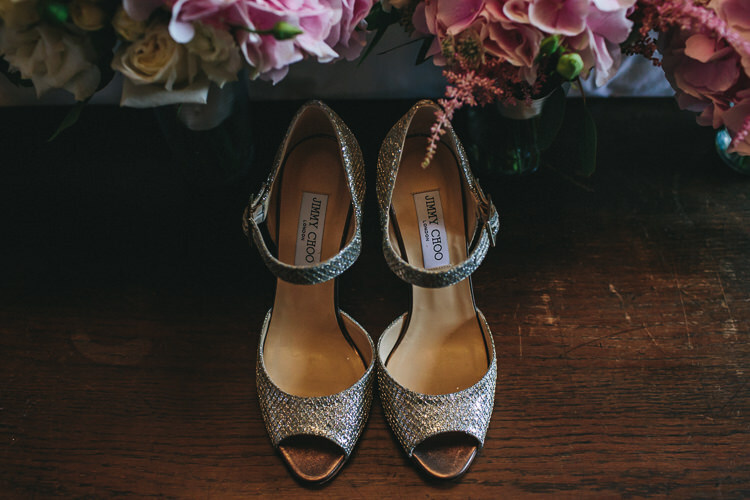 For her shoes, only Jimmy Choo would do! 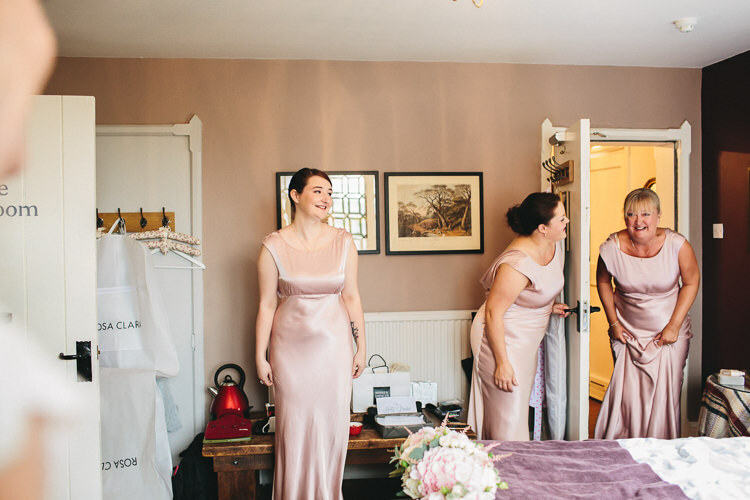 Steven and his groomsmen all hired their outfits from Slater Menswear and the beautiful bridesmaids looked fabulous in their pink Ghost dresses. 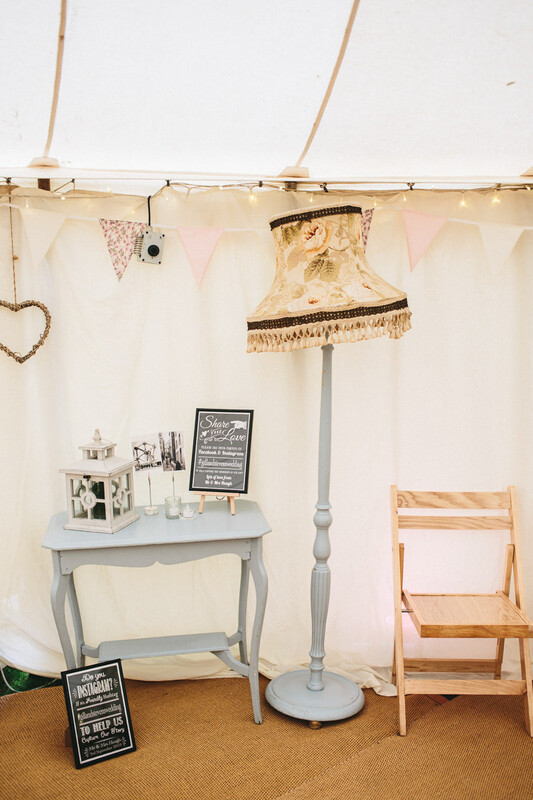 I just love the vintage furniture and mismatched crockery all in pastel shades. 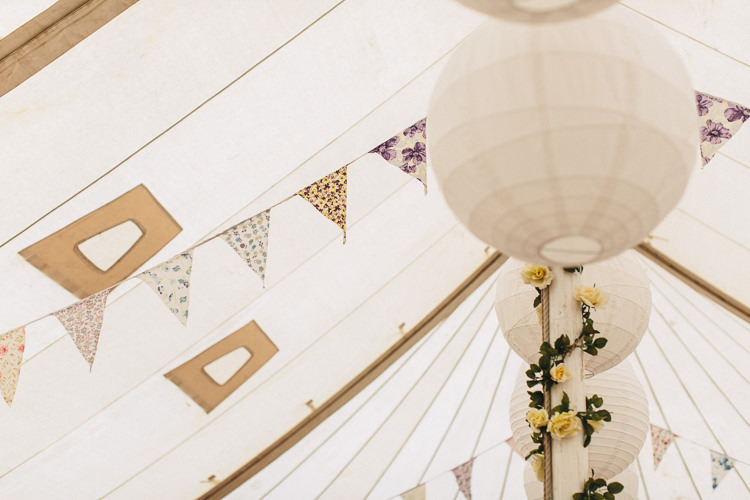 The bunting that adorned the traditional pole tent marquee is simply gorgeous too. 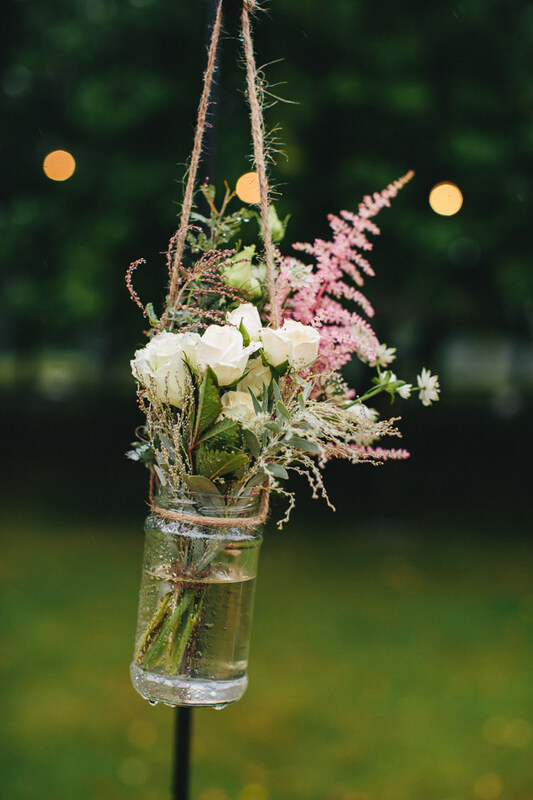 There were also some beautiful flowers, the neat little posies, which Gill and her maids carried are just stunning and you just have to see the pretty florals in jam jars hanging from the shepherd’s hooks. 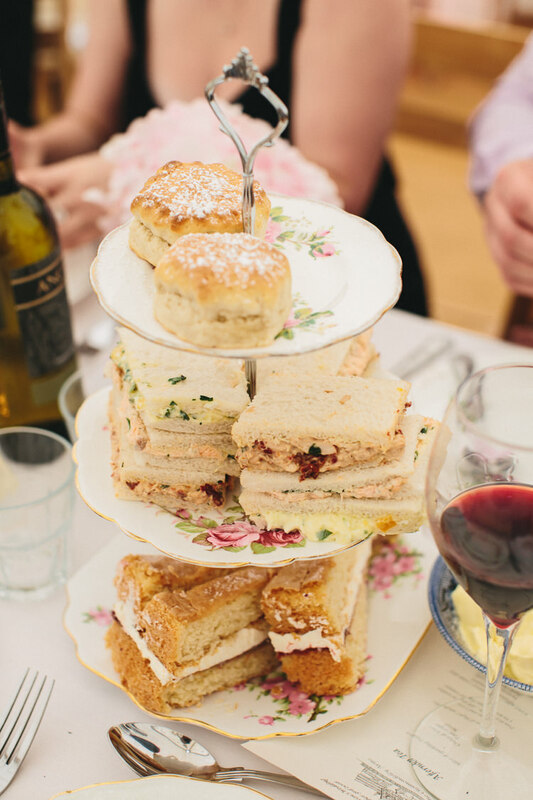 The afternoon tea looks absolutely delicious and what garden party wedding would be complete without an ice cream van and pop up gin bar! 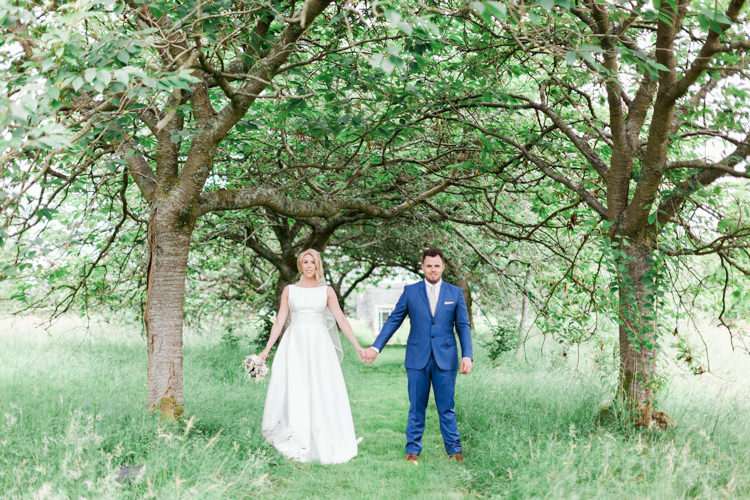 Thanks very much Jessica O’Shaughnessy for these absolutely beautiful images. 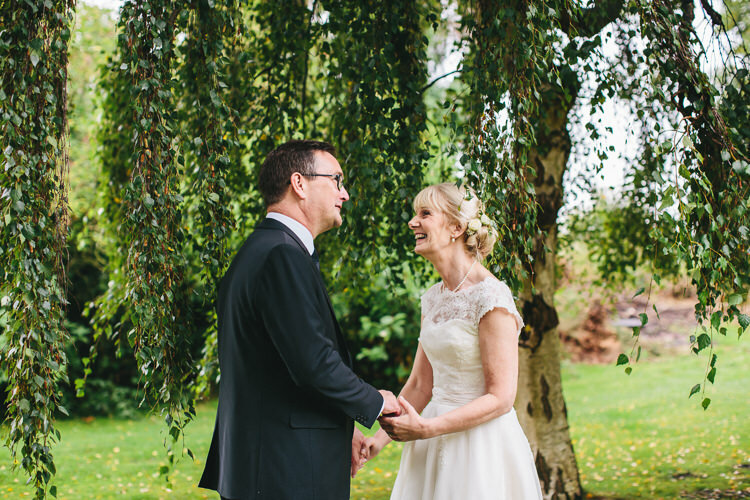 THE PROPOSAL | As I was living and working in Brussels and Steven was living in Cheshire , we didn’t get to see too much of each other. We planned a holiday to New York in September of 2014. 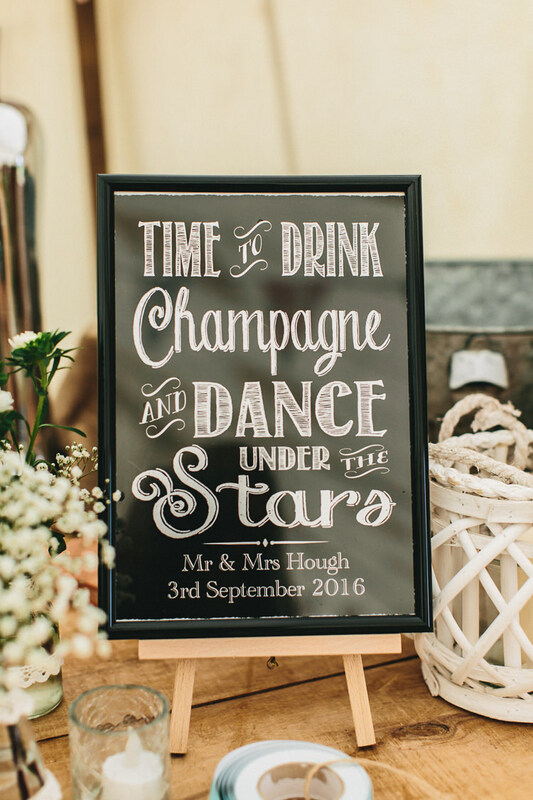 I travelled in to St Pancras station on Eurostar and Steven met me at the Champagne bar – before travelling on together to Heathrow and ultimately New York. He decided that was as good a time as any to “pop the question” !! 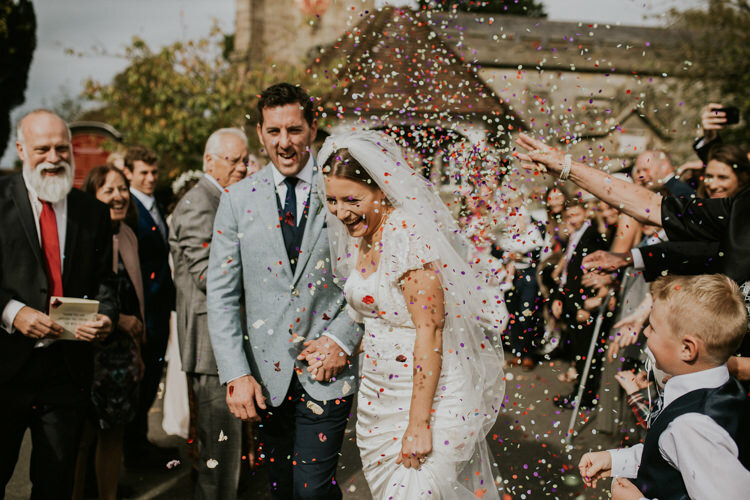 THE VISION | We’ve both been married before, so we didn’t want a big showy wedding, but we did want to share the day with all of our friends and family – in a relaxed style. 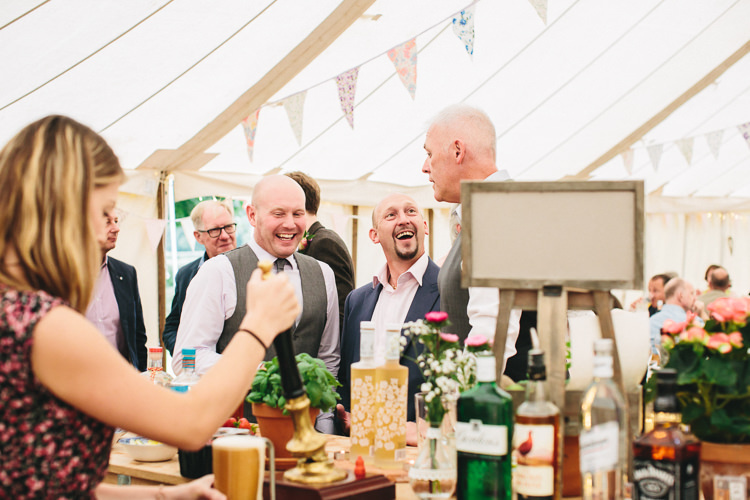 The Cheshire countryside lent itself well to a Vintage Garden Party theme and “The Chum” is our favourite country pub – with the bonus of a paddock, big enough for a marquee and onsite accommodation. THE PLANNING PROCESS | I’m a list writer… there were lots of them! We started in earnest about a year before the date. Venue sorted first and on from there. BUDGET | We had an idea and we’d saved specifically for the occasion, but more importantly we wanted it to feel right. We were quite savvy with our sourcing and we did a lot of the creative stuff ourselves. 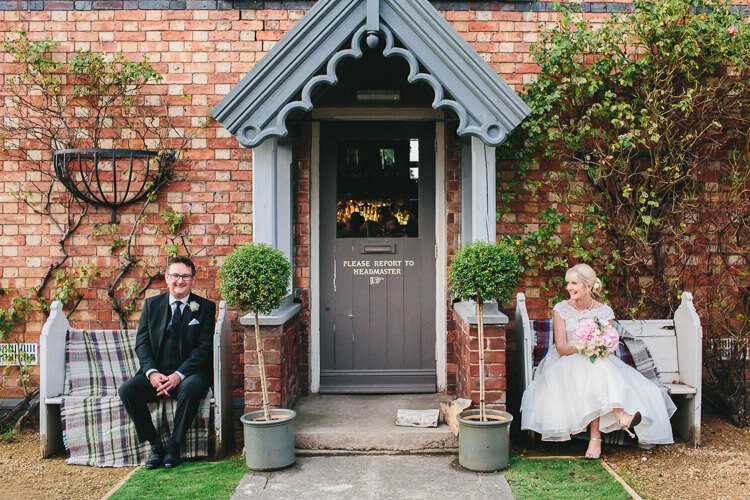 THE VENUE | The Cholmondeley Arms, Malpas, Cheshire. An old Schoolhouse and Headmasters House – converted into a pub with rooms : Affectionately known to all as “The Chum”. 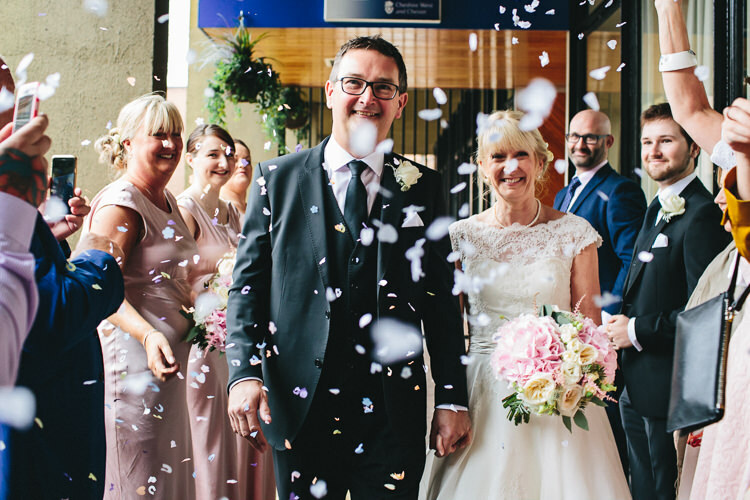 This followed a civil ceremony at Chester Registry office. 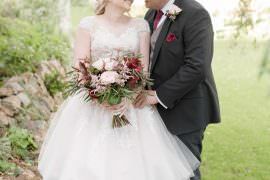 THE DRESS & ACCESSORIES | Dress: Louise Bentley, Frederica . The Shoes: Jimmy Choo, Lace. My something old was a pearl necklace and earrings. My something blue was Jo Malone Bluebell scent. 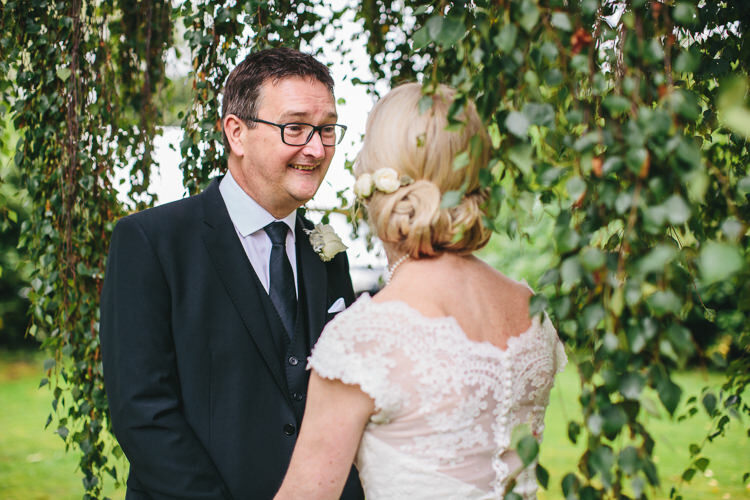 FINDING THE DRESS | The dress was easy – I wanted something which echoed the lines of my Mum’s wedding dress – Ballerina length with corded lace. 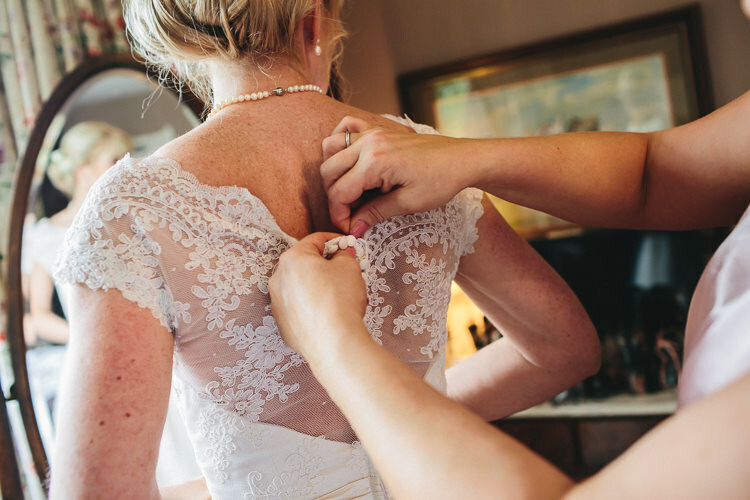 My friend Lindsey had a Bridal boutique at the time and having worked with her in fashion retail, I trusted her to help find “the one”. As for the shoes there was only one answer – Choos. 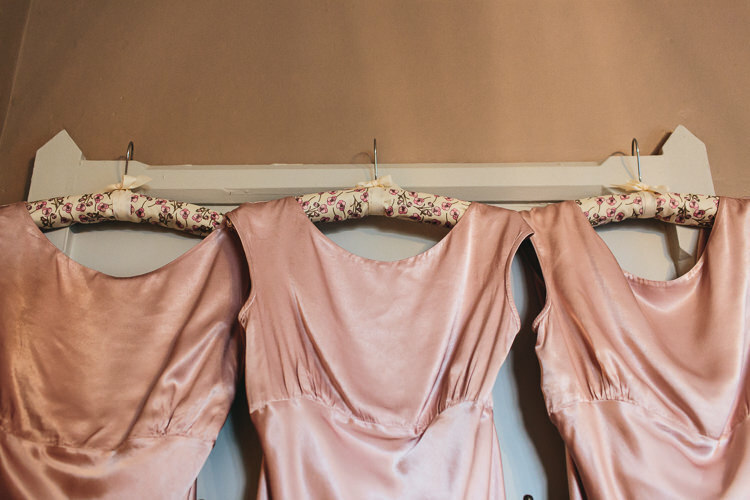 GROOM’S ATTIRE | Steven isn’t really interested in clothes and fashion – but he did organise the Groom and Best man’s suits himself. His Best man was his son Matthew. The only say I had was on colour – Black. 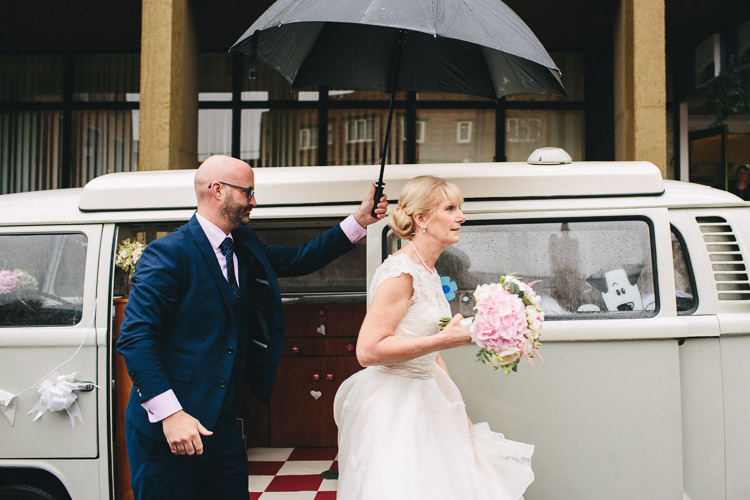 He hired suits from Slaters Menswear in Manchester. A really nice, slim cut suit which had stab stitch detail at the lapel and matching waistcoat. I’d given him a gift of a Georg Jensen watch – with a note to say “this should help get you to the church on time”. 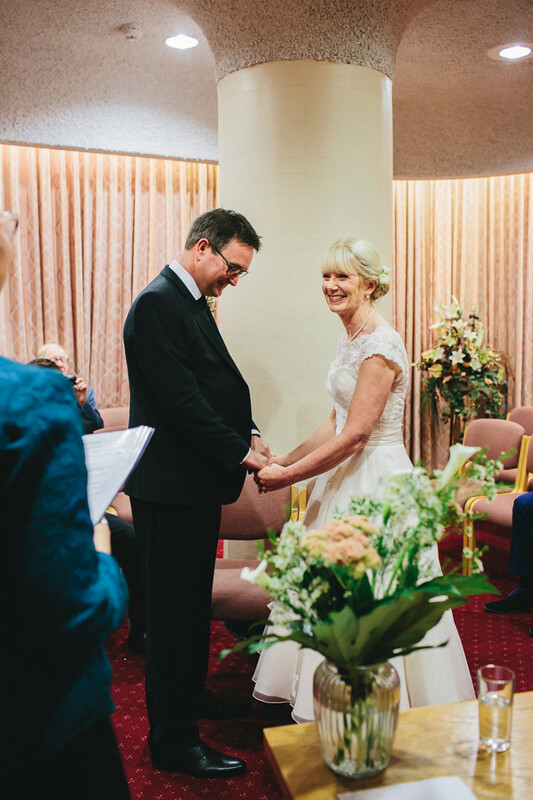 THE READINGS & MUSIC |We had two readings, one from Steven’s sister Bev and one from my best friend and Maid of Honour Claire. 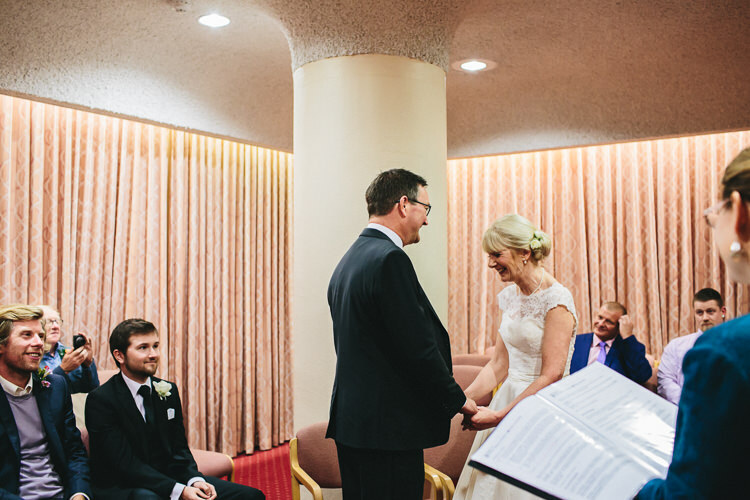 Bev had a little teary moment whilst delivering her reading. 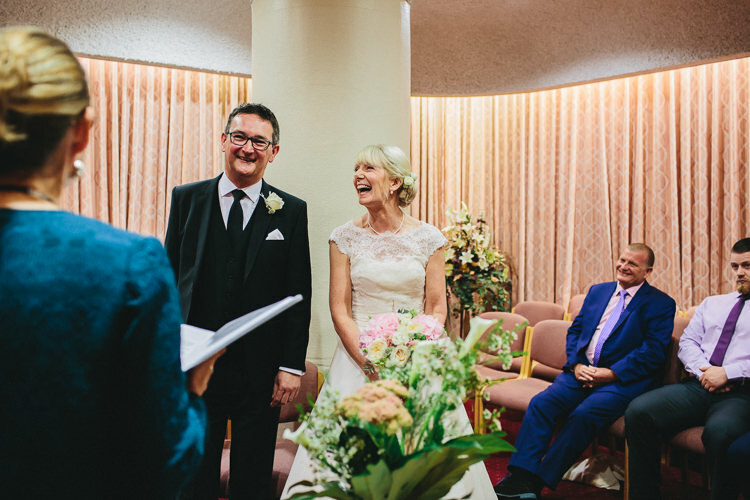 We entered the ceremony to “What a Wonderful World” by Louis Armstrong. For the party background music we spent days collating a playlist of old favourites that seemed fitting for the occasion – we just plugged the iPad into the amp! 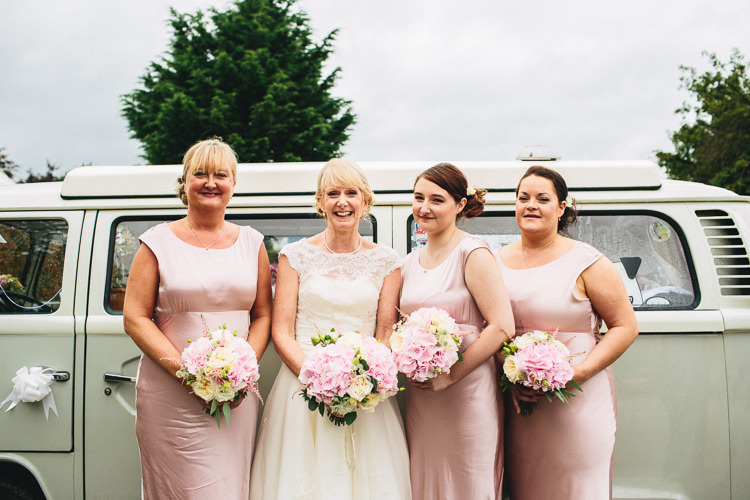 BEAUTIFUL BRIDESMAIDS |Maid of Honour was my best friend and work colleague Claire. We’ve known and worked together for years – the minute we first met we just clicked. We also asked Steven’s sister Bev and his daughter Lucy. 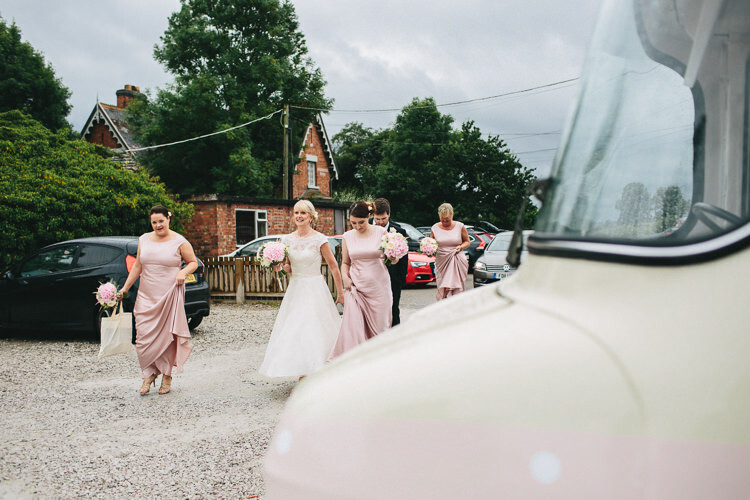 They all looked fabulous in their bias cut, vintage inspired, Ghost dresses. THE FLOWERS | Again I wanted to reflect the casual country garden theme – no huge bouquet, just posies. 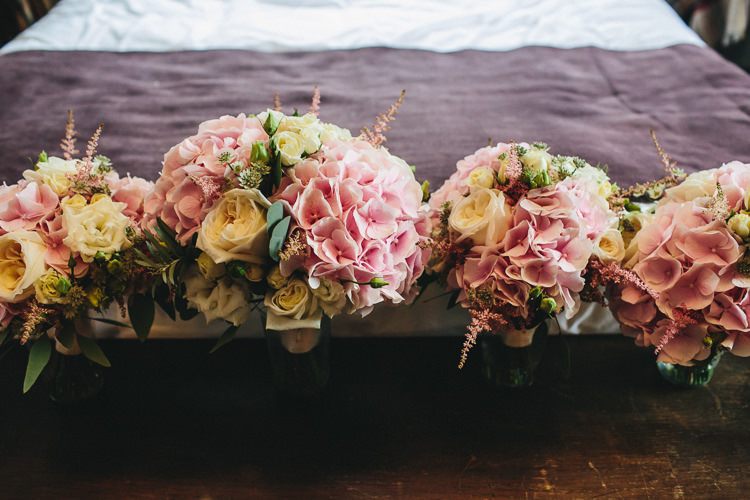 Green Earth flowers worked some major magic in bringing my ideas to live – beyond my expectations. Huge Hydrangea blooms in the softest shade of pink along with smaller flowers. 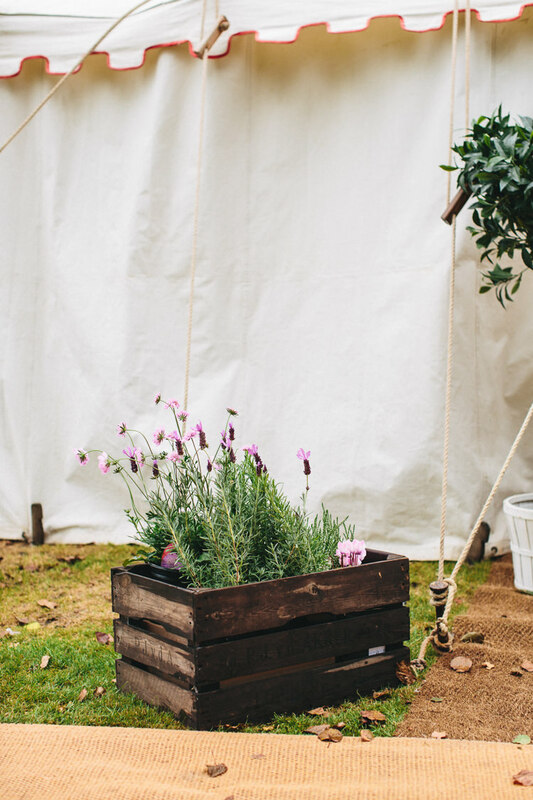 Laura made up casual arrangements in jam jars for the tables and we had some shepherd’s hooks along the walkway into the marquee, where we hung more jars. 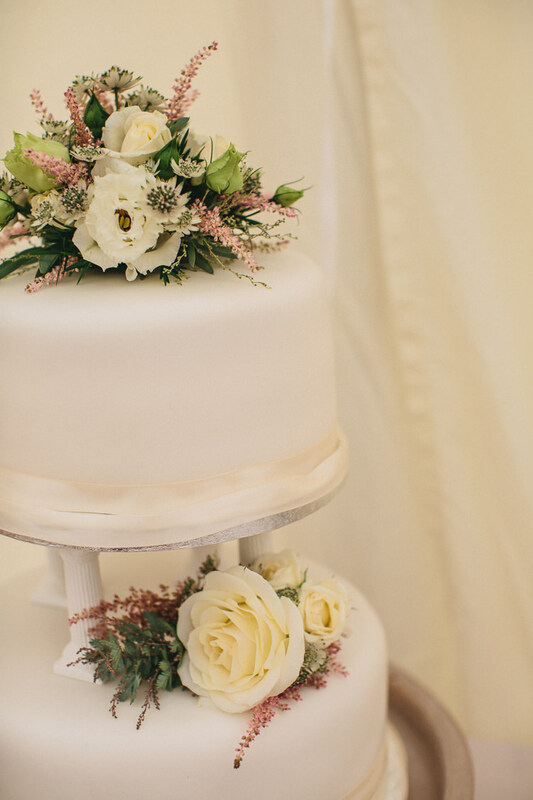 THE CAKE | A simple, two tier cake – no frills. Lemon Tree Bakery provided the cake and we dressed it with some flowers. They provided some delicious Macarons too – another obsession of mine! 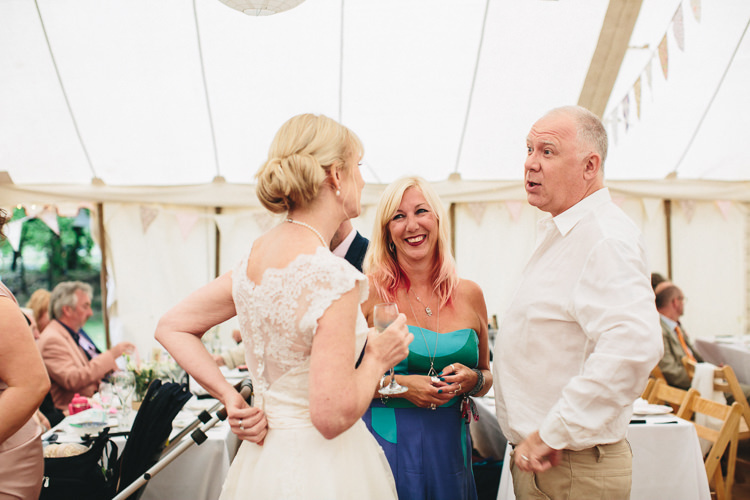 YOUR PHOTOGRAPHER | Steven found Jessica O’Shaughnessy – one of his tasks, which I’m glad to say “the boy done good”. Having discussed the plans for the day with her in the early stages , I had the utmost trust in her. I can truly say that it was like having my best friend along with us. Jessica was so calm and supportive – yet at times she was so discreet that she disappeared into the crowd. The resulting images were candid and relaxed, exactly as we wished. Jessica is a very special lady. 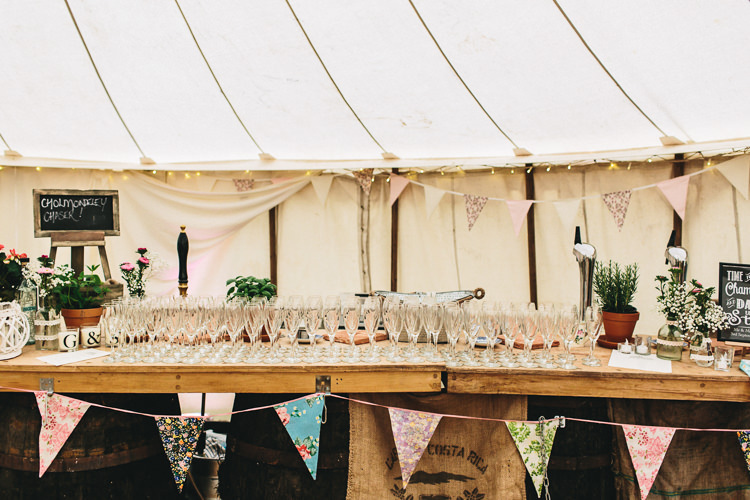 THE DETAILS & DÉCOR | I had a Liberty print fabric that I was obsessed with at the time – so that somehow started the thought process. 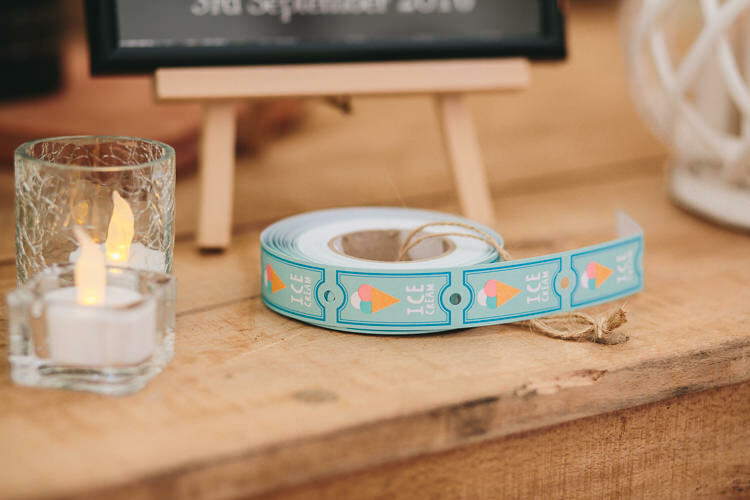 The invites were based on the old fashioned Fortune teller that you make as a child ( the origami type that you move with your fingers to ask and answer certain questions) this carried the floral Liberty print as part of the scheme. The Save the dates and RSVP’s tied in with this too. My other friend Claire helped bring my designs to life. I set myself to work on making favours and 60 metres bunting during my spare time whilst in Brussels. 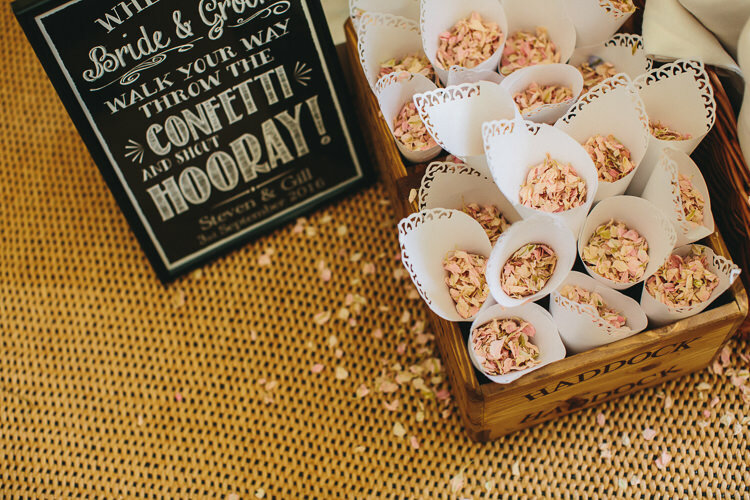 Favours were Liberty print, heart shaped lavender bags – I made 150 of them – tons of love! 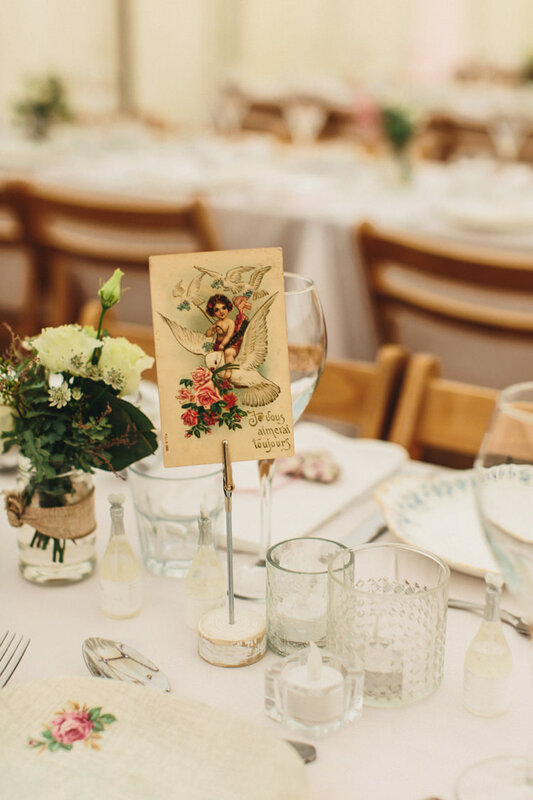 I also scoured the vintage markets for French postcards – Victorian love notes – which we used for table decorations. Being apart from Steven was a good way to keep some things secret and maintain the element of surprise for him. 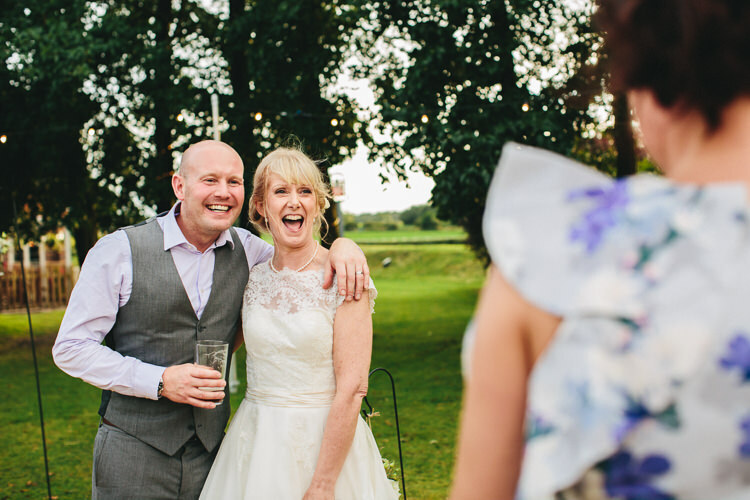 I stitched a heart shape patch of the floral print to the inside of my dress bodice – in remembrance of my Mum. 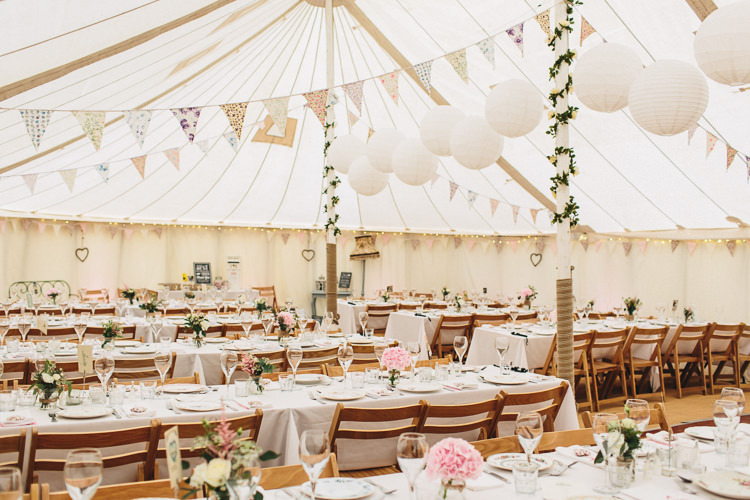 The Marquee was Victorian style, with paper lanterns and bunting a plenty, provided by Posh Frocks and Wellies. 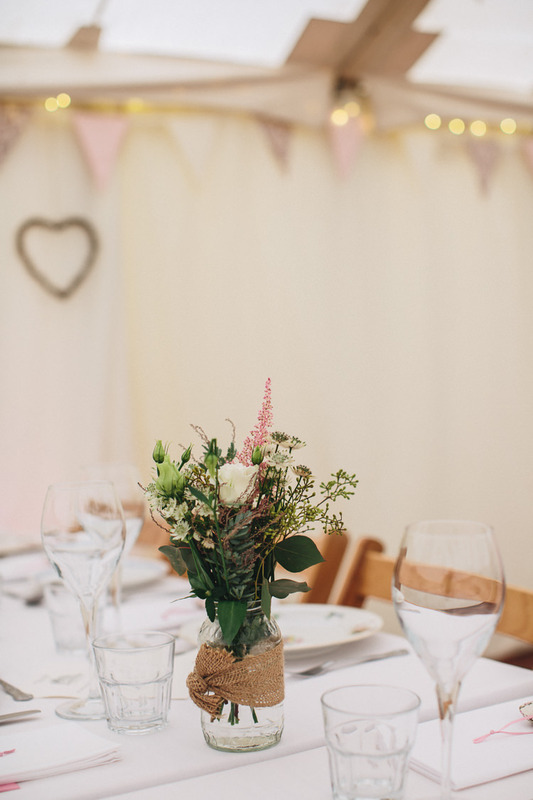 They set it up a couple of days before the wedding, so that we had plenty of time to dress the marquee and arrange tables etc. We did the majority of this the day before with the help of Bev and Claire. We were joined later at The Chum by Lindsey and Lucy for a Gin tasting session and a good natter. 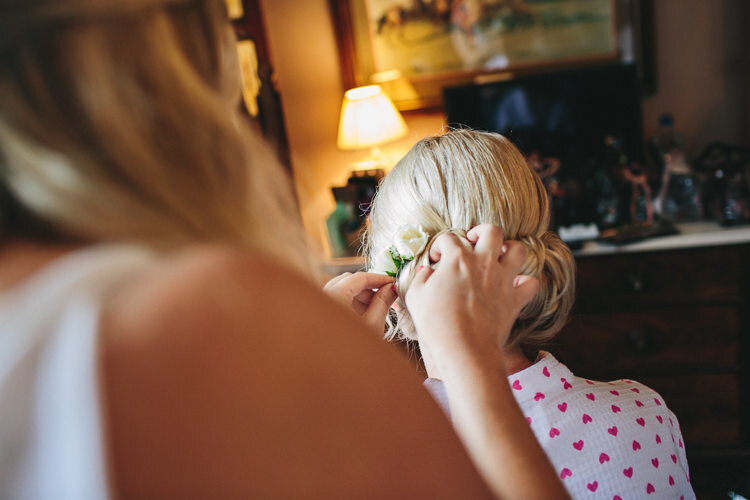 We had booked out rooms at The Headmasters House for all the wedding party. 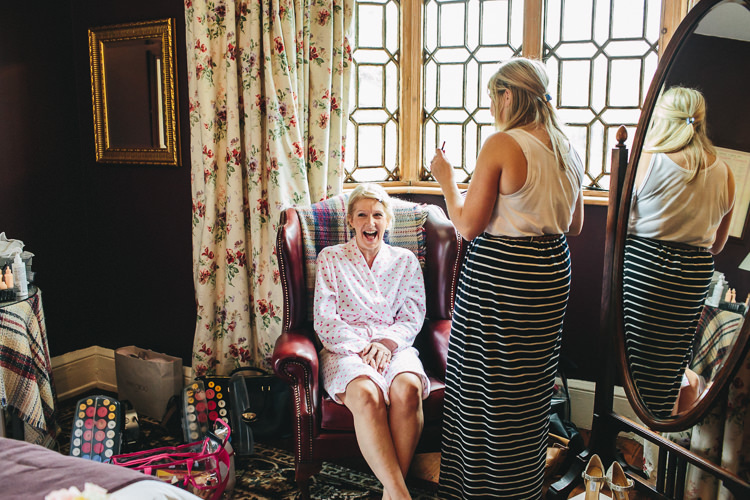 Holly Lander was our make-up artist for the big day and was great at keeping us all calm whilst working her magic on us. 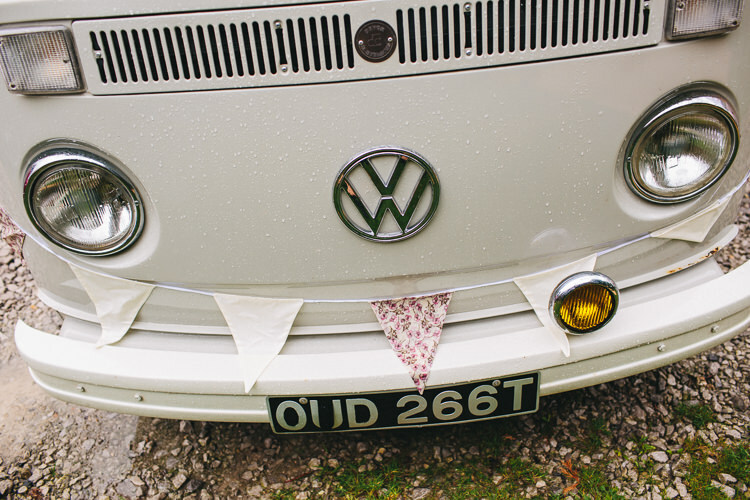 Our transport was “Hattie” and VW camper van, despite the rain she did us proud. 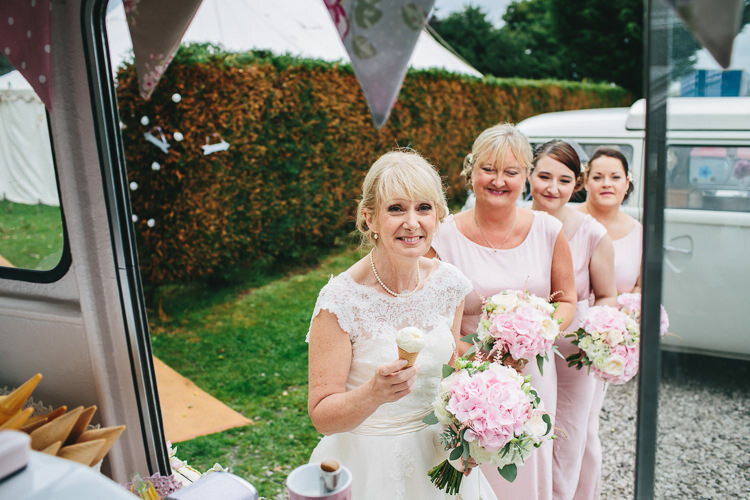 Claire organised that and decked it out in bunting and blooms – and a spot of fizz for the journey to the ceremony. 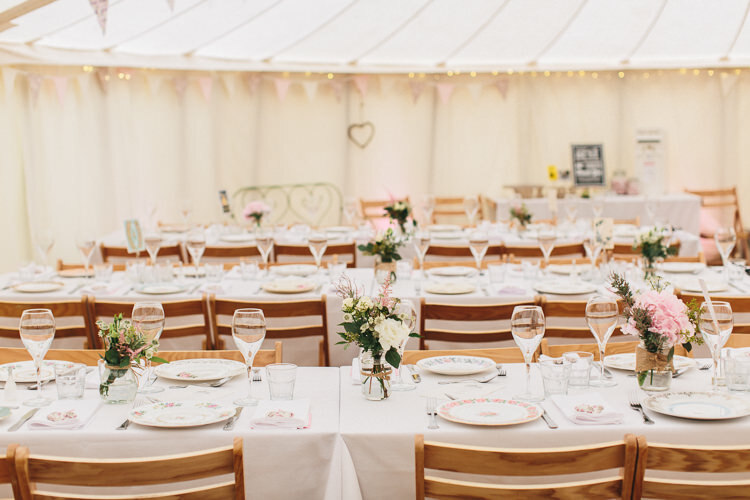 Tressle tables and chairs for the guests – no seating plan, everyone should just feel free to mingle. 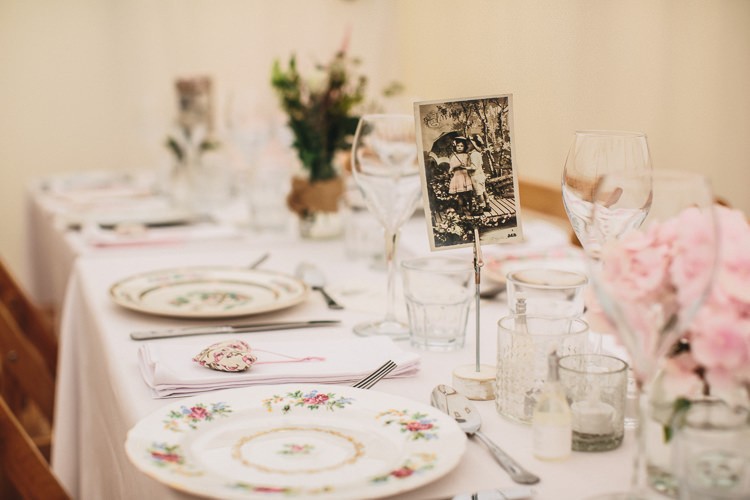 Afternoon tea was served on mismatched vintage china, with lashings of prosecco – rather than a formal wedding banquet. There were positively NO speeches!! 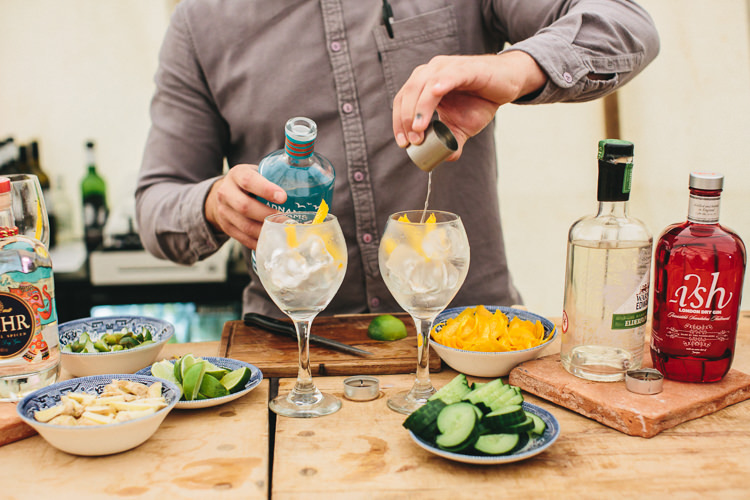 We also had a great little pop up Gin bar which The Chum often use for such occasions. 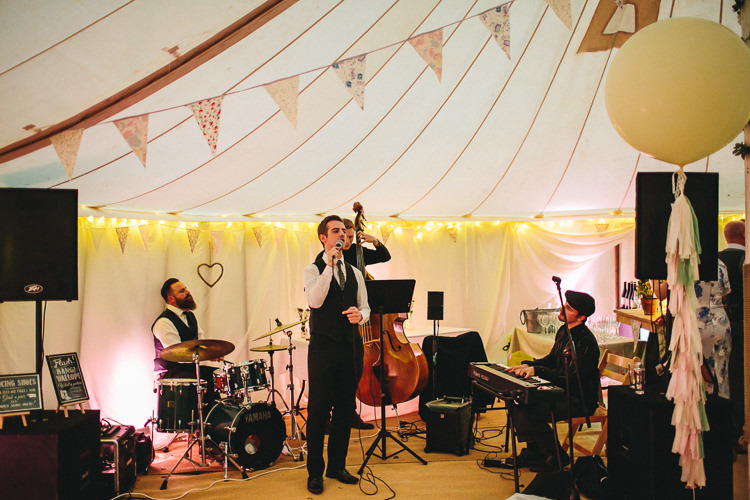 The band was a small, rat pack style band called The Chaser Quartet. They got everyone up dancing, long into the evening. 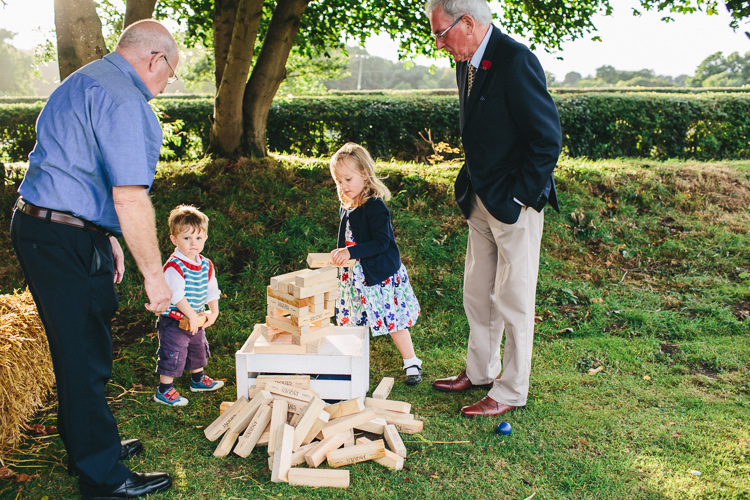 It was a bit of a rainy day throughout – which did curtail any garden games – but didn’t dampen spirits. By late afternoon the sun had popped its head out and folks were able to enjoy the outdoors . 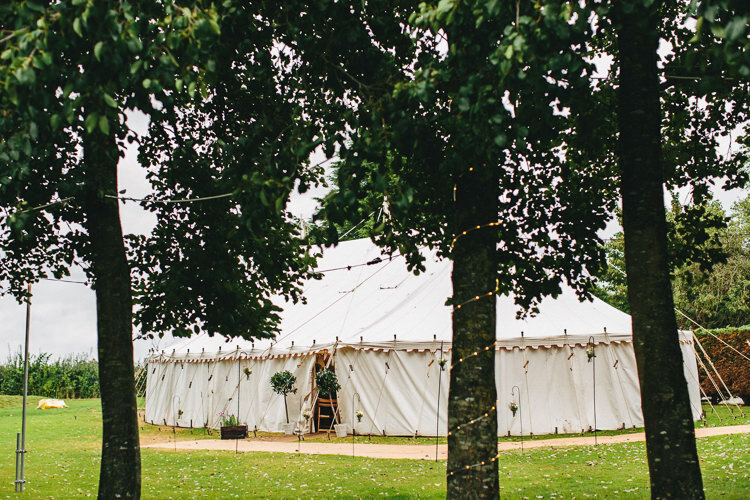 At dusk the marquee and grounds looked magical dressed in fairy lights. 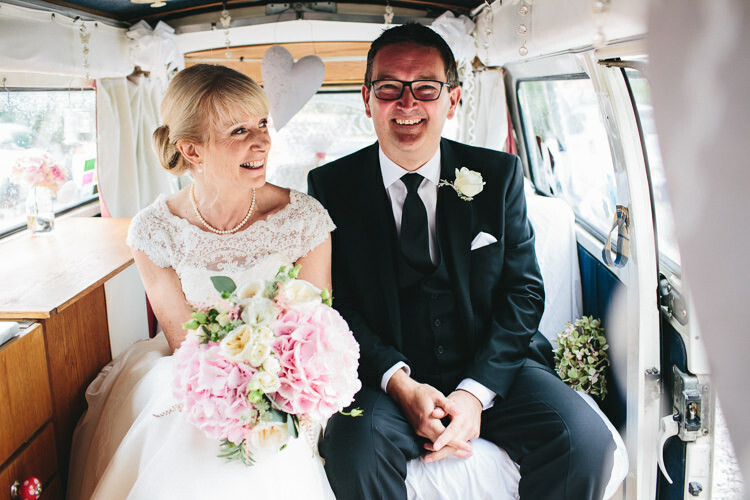 THE HONEYMOON | We escaped for a relaxed week in Cornwall and rented a cottage in Mousehole – we didn’t want to jet off anywhere long haul, save that for the first anniversary!! 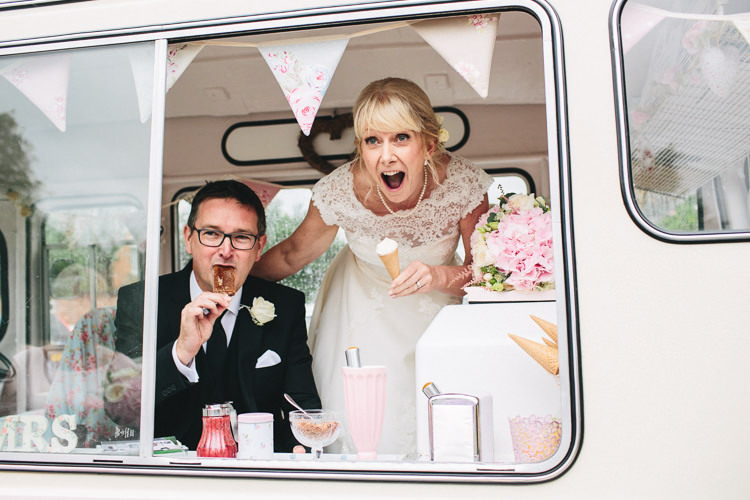 MEMORABLE MOMENTS | The moment we walked into the marquee as Mr and Mrs – clutching our ice creams… the cheers from our guests were overwhelming!! ADVICE FOR OTHER COUPLES | Don’t stress… lists are great but don’t be a slave to them. It’s quite easy to get everything booked and ticked off the list , but suddenly there comes a time when you have to remember to pay the deposits and balances… that almost caught us out a couple of times!! Take a moment to appreciate the day – it’s true to say that it takes so much time and effort to plan and it’s over in the blink of an eye.